This has been said before but it cannot be said enough. Republican presidential candidates and Republican members of Congress are out of touch with Republican voters on the necessity of raising taxes to reduce the budget deficit. A Washington Post-Bloomberg News poll conducted Oct. 6-9 found that 68 percent of all voters and 54 percent of Republican and Republican-leaning voters favored raising taxes on incomes above $250,000 (i.e., the Obama plan) to tackle the deficit. On the question of whether to reduce Social Security or Medicare benefits to reduce the deficit, 83 and 82 percent, respectively, of all voters opposed. For Republicans and Republican-leaners, these proportions were only slightly lower: 79 and 77 percent, respectively. Entitlement spending will have to be cut, of course, to reduce the deficit, because entitlement spending represents a majority of all federal spending. (Only one-fifth of federal spending resides in the "non-defense discretionary" category currently being whittled to the bone.) But that option is pretty unpopular with just about everyone and it is therefore politically unwise for Republican politicians to try to balance the budget through spending cuts alone. "Under existing conditions of weak global demand, austerity would simply lead to a vicious circle of yet weaker demand, weaker investment, more unemployment, and still weaker demand, ad infinitum – the familiar “downward spiral” of all “great” depressions wrought by the “paradox of thrift.” This is especially true if austerity is pursued simultaneously in Europe and the United States, as now is in real danger of happening owing to European measures that are just as wrong-headed as now-voguish American ones. And if the emerging economies in Asia and elsewhere begin to experience slower growth rates, as is now being projected, U.S. austerity will do yet more damage." To whom, exactly, do Republican officeholders and candidates think they're pandering? The Tea Party? Evidence has begun to trickle in that even the Tea Party isn't as anti-tax as Republican party leaders. On Aug. 1 the New York Times ran a Page One story by Kate Zernike (who recently published a book about the Tea Party) that said "the power of the Tea Party as a singular force may be more phantom than reality." Zernike then went on to report: "When Tea Party supporters were asked if the debt-ceiling agreement should include only tax increases, only spending cuts, or a combination of both, the majority — 53 percent — said that it should include a combination. 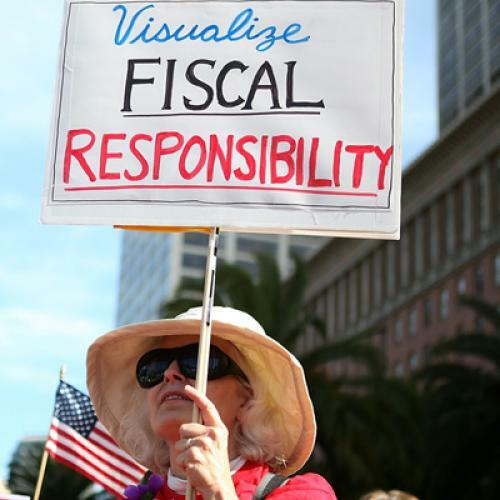 Forty-five percent preferred only spending cuts." The story didn't get much play elsewhere because readers couldn't wrap their minds around it. How could Tea Party supporters not be thinking like ... Tea Party supporters? And if the Tea Party hasn't kidnapped the Republican party, who the hell has? I don't know the answer to this last question. But I sure hope this fever breaks soon.